Dr. Murtaza Adam, who trained at Wills Eye Hospital, Philadelphia, PA is now located in Denver, CO, at Colorado Retina Associates. 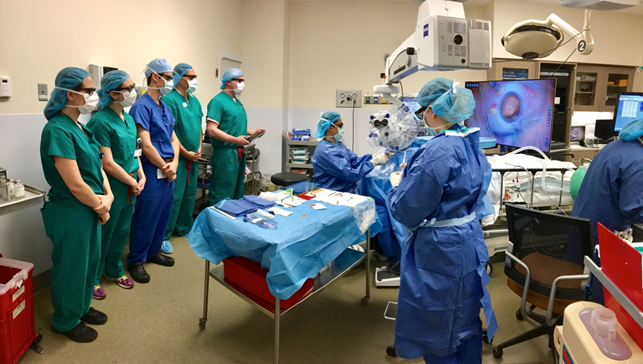 Dr. Adam presented Wills Eye Hospital’s, Comparison of Three-Dimensional Heads-Up Display Surgical Platform to Standard Operating Microscope for Macular Surgery, at the Retina Society in San Francisco in September. Wills Eye Hospital conducted a prospective, randomized, single-center unmasked study of patients undergoing 23, 25 or 27-gauge PPV for epiretinal membrane (ERM) and full-thickness macular hole (MH). The patients were randomized 1:1 with either 3D Heads-Up Display (HUD) or Standard Operating Microscope (SOM). Wills Eye Hospital surgeons included in this study were Drs. Katherine Talcott, Kareem Sioufi, Christopher Aderman, Ferhina Ali, Phoebe Mellen, Sunir Garg, Jason Hsu and Allen Ho. At the upcoming Retina sub-specialty day on Friday, October 26 at the American Academy of Ophthalmology, 3D visualization Heads-Up Display vs. Standard Operating Microscope will be a topic of discussion. Last year, Dr. Julia Haller, Wills Eye Hospital, Philadelphia, PA and Dr. John Kitchens, Retina Associates of Kentucky, Lexington, KY, provided their opinion of 3D HUD vs. SOM. Both Drs. Haller (CON) and Kitchens (PRO) made excellent points during their debate. The final vote was in favor of Dr. Haller. There were 39 patients with a mean age of 67.6 years. RetinaLink discussed Dr. Adam’s surgical impressions with ALCON’s NGENUITY® 3D Heads-Up surgical display. Dr. Adam also shared three 3D surgical videos, monocular CE/IOL, https://youtu.be/TzRrjPlxXz0, Diabetic Vitreous Hemorrhage with ILM Peel, https://youtu.be/yATV_pK-x-8 and Monocular Diabetic TRD (click on video). RetinaLink (RL): In your surgical experience, what was your learning curve? 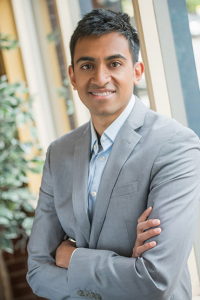 Murtaza ADAM, MD (MA): I didn’t experience a significant learning curve. My generation of surgeons grew up playing video games so using the 3D Heads-up Display was fairly intuitive. I believe the learning curve is longer for surgeons who have used the SOM for years or decades; however, there are many experienced surgeons out there who are exceptions to this. One’s flexibility in the OR can color the experience with using new technology. I try not let the psychology or fear of uncertainty associated with using new technology or techniques stop the evaluation. As surgeons, we are trained to protocolize every aspect of what we do in the OR. With that training paradigm, it’s easy to fall into a trap of doing the same thing over and over again, even when presented with something novel and potentially advantageous over the standard of care. RL: Please outline the in-service prior to evaluating the Heads-Up Display for the Wills Eye Hospital study. The study showed illumination was an issue. MA: Our service utilized the HUD for a variety of cases including primary and complex retinal detachments, IOL exchanges, and macular puckers/holes. We performed a small case series of 10 patients in which we experimented with working with a very low level of endoillumination, harnessing the power of digital gain with the HUD to amplify the brightness of the surgical field. We found that in 9 of 10 vitrectomy cases, we could comfortably operate at 10% endoillumination power. RL: How many times did you evaluate HUD before participating in the study? MA: I’m not sure of the exact number, but I performed somewhere between 15 and 20 cases on the HUD before we began the study. RL: Would you recommend your colleagues evaluate 3D Heads-up Surgery in their hospital or ASC based on your experience? MA: It depends on the situation and finances, but I certainly wish I had this visualization system available in my practice after graduating from Wills. I see this technology as one of the first important steps in augmenting our surgical field. Aside from the benefits related to ergonomics, stereopsis, resolution, reduced endoillumination requirements, education/teaching, and promoting OR engagement, 3D HUD surgery carries great potential to improve the way we visualize our surgical field. As retina specialists, using and critically evaluating this technology is one of the most important ways we can improve its utility and, ultimately, patient care.